OMG Guinness cupcakes! I am so making these. Any excuses to buy Guinness. I am soooooo making those cupcakes. Like 5 dozen. I have similar recipes from last year. I'll chow them after my 5k next Sunday. YUM, YUM, YUM! Can't wait to try these! OK, Guinness? And cupcakes? TOGETHER? Is this heaven? SOOOOO trying these!! Thanks! Those look incredible! Great recipes for us. Thanks! As tempting as all those goodies look, think I'll just enjoy the Irish tradition of drinking beer!! I am definitely making the potatoes for my St Patty's Day get together. Thanks for the great ideas! Yum! Start out the morning with these delicious muffins and 'Irish' coffee and head into the afternoon with lots of great Irish beer. Works for me!! What a great recipe to make for St. Paddy's day. Thanks. OMG, I am totally making the Guinness and the potato things. They look delicious. As a non-coffee drinker, the espresso ones don't appeal to me. I cannot wait to try these recipes. YUM! St.Pattys day is big in my family! The whole corn beef and cabbage with potatos and soda bread. I may have to try to make one of these! I don't drink coffee or drink, but those potatoes look awesome! I'm not sure I could choose between the two of those recipes. They both looks so delicious! Sweet mother of delicious, those look good! I think I shall have to try the Guinness cupcakes. Coffee and cupcakes. Together. In one scrummy dessert. Ummm...yes please! I am extremely intrigued by the Guinness cupcakes. Can I just come to your house? 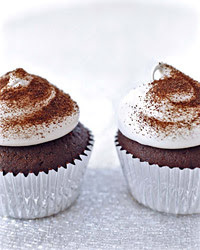 Mmmm...Irish coffee cupcakes...look delicious!!! I'm following you :) Have a wonderful weekend! Oooooh! I can't pick a favorite! I think the potato muffins first! We are such big hash brown fans around here, that MUST be the right one! potato muffins and guiness cupcakes... two - two - two recipes in one! I just love them! Thanks for sharing JM. Mmmmm. The cupcakes look heavenly! I am sending The Source to your blog today to look at these recipes. You have some yummy and different stuff here!! Holy St. Paddy's!! Can't wait to try these! My St. Pat's staple is green milk...not so exciting. I am going to try those. Oh my goodness! I will be WIFE OF THE YEAR with the guinness cupcakes! THANK YOU! I'm having friends over for the Oscars. They wanted me to make chili, so I'm making the potato muffins and the Guinness cupcakes. The cupcakes are baking now. The batter tastes delicous. I cannot wait to try these. OHMYGOSH!! Those all sound AMAZING!!! YUM!! The coffee cupcakes look soooo yummy!! Love it! Since I worked for the company that owns Guinness (and lots of other liquor) for years and am half Irish, I'm a big St Pat's Day fan! Tis a wonderful holiday, and hey, everyone's a little Irish anyway! The traditional start of Spring, a day of celebrating what is a new beginning, the best time of the year! Your recipes are already fattening me up, they sound delicious! I'm all over the Guinness cupcakes. Definitely going to try the potato muffins too. I am totally making those Guiness cupcakes. Is it inappropriate to bring them into my son's preschool? Might extend naptime a little and really who couldn't use a longer nap on St. Patty's Day? The potatoe muffins look so good. I might try that when I make corned beef and cabbage. YUM!!! Oh good lord, those look and sound delicious. Perfect with an Irish coffee to be sure. Sounds divine. I'm thinking I should make this soon! So much delicous-ness in one post! Although, heaven help the kids if they ever got their hands on those cupcakes! Oh darn it.. has my comment disappeared! I will take one of each STAT! Jeezy creezy!! I looooove Guinness!! Cupcakes now?! Oh I'm so making those...and not sharing. And thank you. I have shed a tear over here. I made the Savory St. Patrick's Day Potato Muffins. They are delicious! This recipe is a keeper for cold winter days in the Midwest; these muffins would be great with a bowl of soup.